EarlyStageCancer.com is your Cancer, health-wellness and disease cancer resource. , When cancer is detected in the early stages, the cancer can usually be treated effectively. Key Points to determine the stage of the cancer. Staging describes the extent or severity of a person’s cancer. Knowing the stage of cancer helps the doctor plan treatment and estimate the person’s prognosis. Staging systems for cancer have evolved over time and continue to change as scientists learn more about cancer. The TNM staging system is based on the size and/or extent (reach) of the primary tumor (T), whether cancer cells have spread to nearby (regional) lymph nodes (N), and whether metastasis (M), or the spread of the cancer to other parts of the body, has occurred. Physical exams, imaging procedures, laboratory tests, pathology reports, and surgical reports provide information to determine the stage of a cancer. What is Staging of Cancer? Staging is based on knowledge of the way cancer progresses. 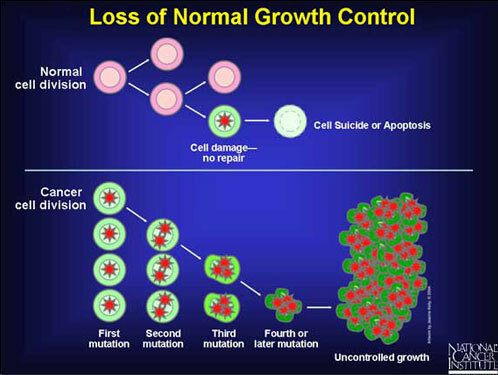 Cancer cells grow and divide without control or order, and they do not die when they should. As a result, they often form a mass of tissue called a tumor. As a tumor grows, it can invade nearby tissues and organs. Cancer cells can also break away from a tumor and enter the bloodstream or the lymphatic system. By moving through the bloodstream or lymphatic system, cancer cells can spread from the primary site to lymph nodes or to other organs, where they may form new tumors. An example on cancer metastasis leading to a worse prognosis is how early prostate cancer can rapidly be terminal. What are the common elements of staging systems?